I want to start off by saying although this is a post about cleaning, please don’t think that means our home is clean and tidy all of the time! This couldn’t be any further from the truth, as let’s face it, keeping things tidy with three kids, (especially young boys who just have to play in dirt EVERY DAY) is practically impossible! As a way to combat this, I’ve been using the zone cleaning method (which I know isn’t for everyone) for quite some time now, after first learning about it thanks to Leanne from Organising the Four of Us and today I thought I’d share with you how zone cleaning works for our family and some of the benefits I find to doing it. So what is Zone Cleaning? Zone cleaning is where you divide the areas of your home into ‘zones’ and then regularly clean each zone for a specified time each week/month. Like anything, this can be interpreted and adapted to suit what works best for you and in our case, I focus on just one or two areas of our home to clean each day and spend 20 minutes on both. For example, I allocate Tuesday mornings to clean the kids bathroom and I will set a timer and spend no more than 20 minutes (usually much less) giving it a clean, mopping the floors and chiseling the dried toothpaste off the mirror…..
How Zone Cleaning Works for us? Between looking after the boys, running between school and kinder and working from home, finding a big ‘chunk’ of time to clean the entire house is a bit tricky for me. 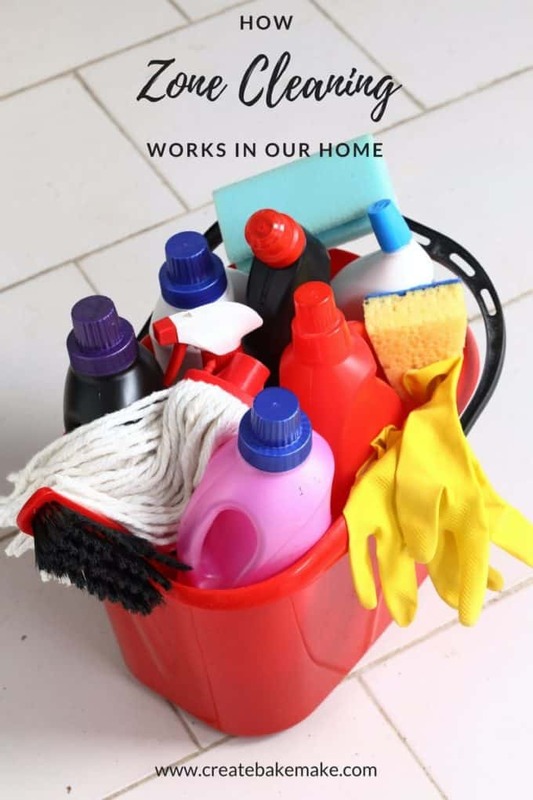 By spitting the areas of our home up over the week, it helps make cleaning more manageable and overall I find it takes less time as I keep on top of things better knowing I only have 20 minutes to do it each week. I like to tackle this area on a Monday morning once our eldest has gone to school as it gets a big workout over the weekend. While I will sweep and tidy these areas through the week, on a Monday I will do those extra jobs like cleaning/retrieving toys from under furnitures, wiping down all the surfaces etc. This area also gets a good workout over the weekend as it’s often used as a thoroughfare to access the side of the house by the kids. It really doesn’t take much longer than 10/15 minutes to give everything a wipe down and clean the floors. It honestly feels like I just clean this area and it’s already trashed again, the joy of having three young boys! As Wednesdays are my offical ‘work day’ I like to make sure my office is tidy and ready for a productive day, otherwise I’ll procrastinate and clean it up instead of working! As our bedroom is directly off the upstairs living area, all of the boys love to hang out/play/jump on the bed in there. First thing on a Wednesday morning before I start working I will gather up the toys/clothes that belong to the kids and put them away and I’ll also give the ensuite a clean. Only this area and our bedrooms are carpeted in the house, so I will spend 15/20 mins tidying and giving all the upstairs rooms a quick vacuum. As I usually get our groceries delivered on the weekend, I spend a little time on Thursdays cleaning out the fridge and pantry and also doing a stocktake of what we have in there. It’s just our toddler and I at home on a Friday so I spend time giving the kitchen a good clean and will do things like wipe down the cooktop, give the dishwasher a clean, rearrange drawers etc. And that’s it! On the weekends I will tackle things like cleaning handprints off the windows/doors etc but I don’t have any specific zones to tackle. I will spend a good chunk of time getting ready for the week ahead by making snacks for the kids and meals for either through the week or to pop into the freezer for another time. Again this is just what we do and what works for our family, and I know it isn’t for everyone. I’d love to know if you also do zone cleaning and how it works in your home, leave a comment and let me know! I do something similar on a much smaller scale. It makes it much easier to keep on top of things during the week and the best bit is that there is always one place in the house that is looking it’s best! I needed this so bad so I have now just written up my own zone cleaning plan. Breaking it down is far more helpful than just looking at everything and throwing my hands up. Ha! “Divide and conquer” seems like the perfect strategy for a less stressful tackling of the house cleaning duties. My schedule looks similar, although, every week is different and I may have to move things around a bit for convenience.